KOMO TV: Here are some sobering statistics for parents. The numbers are very scary. One in three 8th graders has tried alcohol. One in 5 teenagers binge drink. Teen alcohol use kills about 6,000 people each year, more than all illegal drugs combined. Joining me now to talk about this problem are Mothers Against Drunk Driving Volunteers Mischelle Davis and Stacey Rhodes. Thank you so much for being here ladies. Mischelle it is important to raise awareness the problem. Why now? Why this time? MISCHELLE DAVIS: During graduation season, prom season unfortunately a lot of kids couple alcohol with their celebrations. So obviously that is a big problem. But we are leading into the 100 most deadly days of the year which are in June, July, and August when 30% of all underage drinking fatalities happen in those months. KOMO TV: And it is not a coincidence at all, as you said, summer break is right around the corner, kids want to celebrate, they don't have to go to school, they are graduating... Stacey I understand thyat you are a very tireless volunteer and that there is a story behind that. Can you share? STACEY RHODES: There is. My son, Ryan, was killed on June 14th of 2008. He was a passenger in a car and his best friend was the driver. And the most tragic part of the story is his friend's mother is the one that gave them alcohol and thought that it was okay for them to leave. So especially this time of the year where we do have graduation coming up, it as no point okay to social host young (underage) kids. And people think/parents think that if oh I keep them here and I take the keys....just because you take the keys does not mean that they are going to be okay and that they will survive. KOMO TV: I can't believe that story. I think that a lot of parents think oh they get fake ids, they sneak away, go to the liquor store and what not... but you are seeing cases of the people closest to them giving them alcohol. DAVIS: Yes, it is a big problem. Stacey, tell them about some of the calls you have been getting recently from other parents. RHODES: I have an 18 year old son that is getting ready to graduate and we have received some phone calls from parents asking if it would be okay for him to attend (and drink) parties at their home. And we just really need to change that way of thinking that as a parent we are not keeping them safe by allowing them to drink in our house. And one think that MADD has recently offered is the Power of Parents program. And you can go on to our website and it will help you talk to your kids about underage drinking, the casualties of that and what can happen. I know it is hard for parents sometimes start that conversation with them. And this is a great resource to go ahead and do that. So hopefully they will go on our website and get this guidance and this help. KOMO TV: Aside from drunk driving which is so dangerous and so deadly, what are some of the other alcohol related problems that you are seeing? RHODES: Binge drinking. That is the biggest problem. It is not necessarily that they go out every single weekend and have 3 or 4 beers. Teenagers tend to not get alcohol every single weekend. But when they do it is large quantities. And they tend to binge drink which leads to terrible outcomes. KOMO TV: And this is not just high school kids. You are seeing kids as young as middle school kids. DAVIS: Eight grade. You quoted the stat yourself. It is happening younger, and younger, all the time. So these awareness programs, talking to your kids early are really, really important. And MADD can help. We have the resources available. They are on our website. And of course the donations always help to get funding for those programs in the schools where we come in and talk about underage drinking and the dangers. 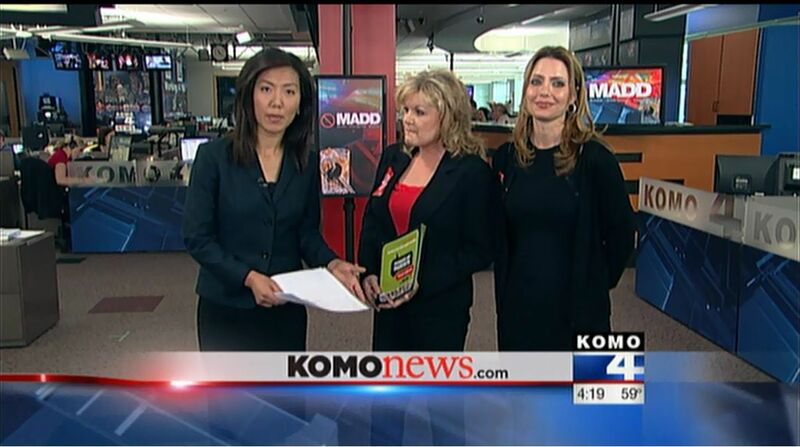 KOMO TV: Ladies, thank you for your amazing work. And thank you so much for being here. It is so important go get the message out.